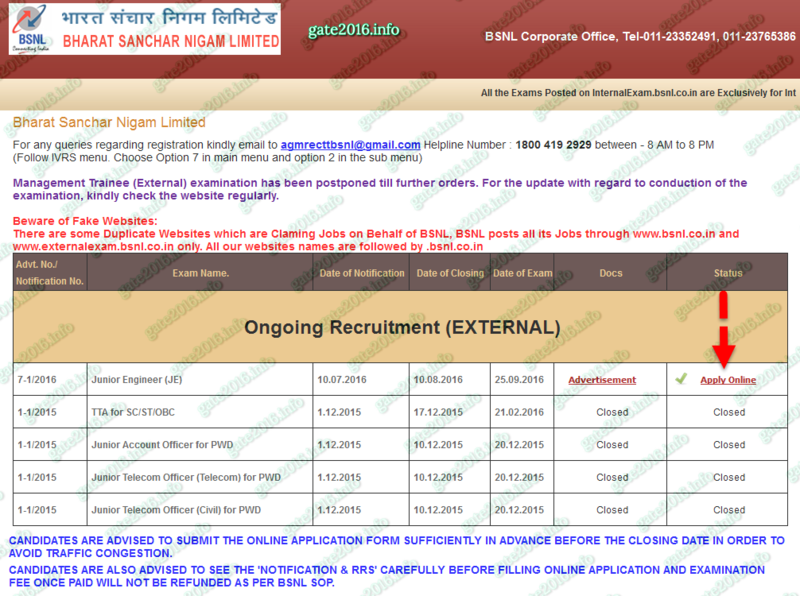 Olxam » BSNL JE » How to Fill BSNL TTA (JE) 2016 Online Application Form ? 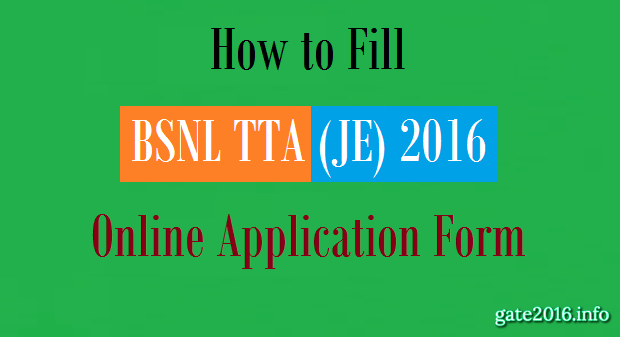 How to Fill BSNL TTA (JE) 2016 Online Application Form ? How to Complain BSNL TTA (JE) 2016 Wrong Questions ? – Check Here! “How to fill Online Application Form of BSNL TTA (JE) 2016 examination ? How can I submit Application Form for BSNL TTA (JE) 2016 Recruitment ? I have forgot my Registration number and/or Password. What to do ? BSNL(Bharat Sanchar Nigam Limited) Advt. – 7-1/2016 for Junior Engineer (TTA) posts online application form filling start from 10 July 2016 (Sunday). Candidates can fill online application form between 10 July 2016 (Sunday) to 10 August 2016 (Wednesday). Candidate have to fill BSNL TTA(JE) 2016 application form in online mode only. Here we are going to explain step by step procedure about how a candidate can fill BSNL TTA(JE) 2016 online application form. When a candidate will click on above give link , will directed to the page as shown in image-1. Candidates applying for BSNL TTA(JE) 2016 will need to complete the application process online only. When a candidate will click on “Apply Online” as shown in image-1, will directed to next page as shown in image-2. Candidate first need to register himself in order to fill BSNL TTA(JE) 2016 online application form. 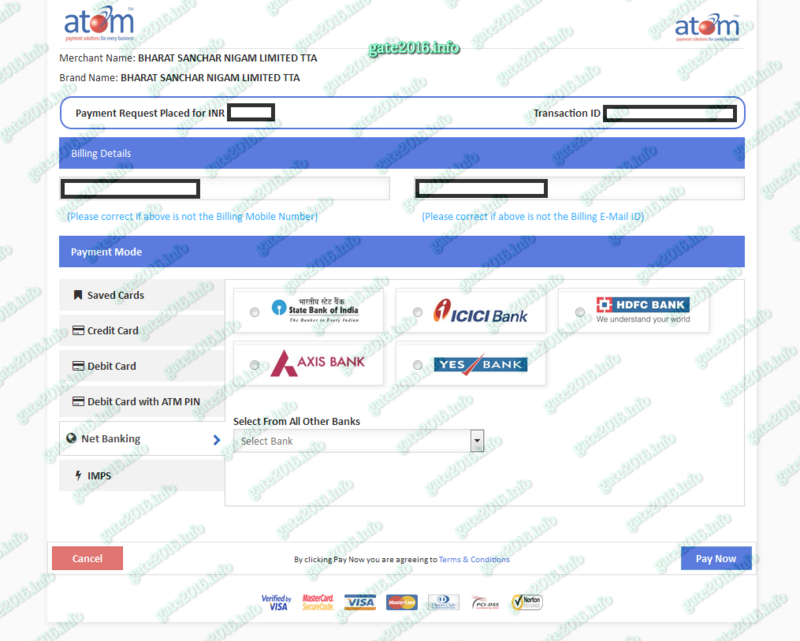 Click on “Click here for Register” at the top of the page as shown in image-3. Must Check : How to Prepare for BSNL TTA(JE) 2016 ? 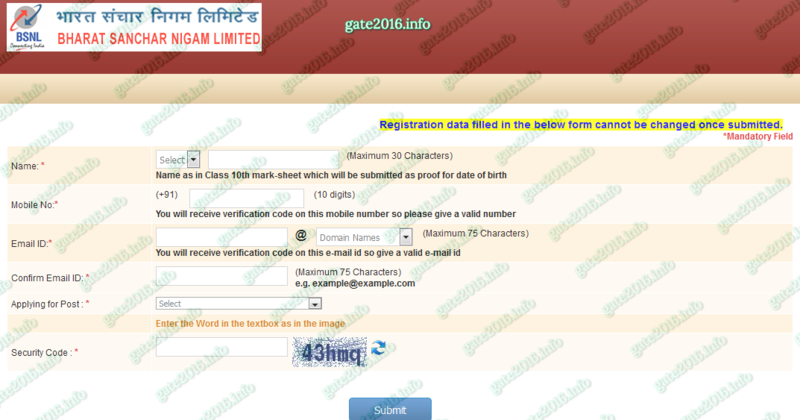 When a candidate will click on “Click here for Register”, will directed to next page as shown in image-4. 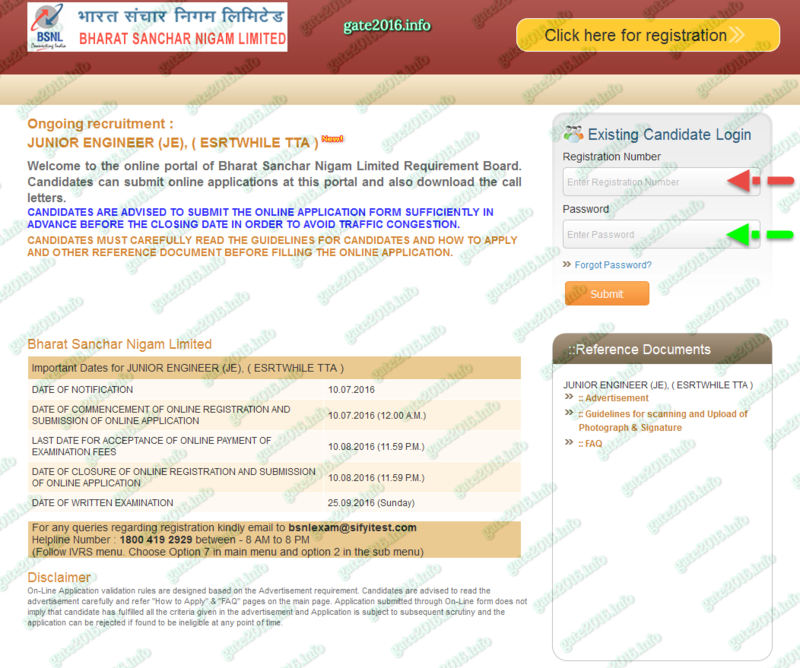 Here candidate will register himself for BSNL TTA(JE) application form filling. Here you need to fill 6 blocks of information related to applicant. Registration data filled in the below form can not be changed once submitted. So candidates need to be careful while filling first step of application form which is “Registration”. When a candidate will click on submit in order to complete his/her registration a dialog box will generate. If a candidate find that all the details entered by him is correct he/she can click on “OK” other wise click on “Cancel” as shown in image-5. When a candidate will click on “Continue” will directed to a page as shown in image-7. Here candidate will enter his/her Registration Number & Password. Then click on “Submit” tab. 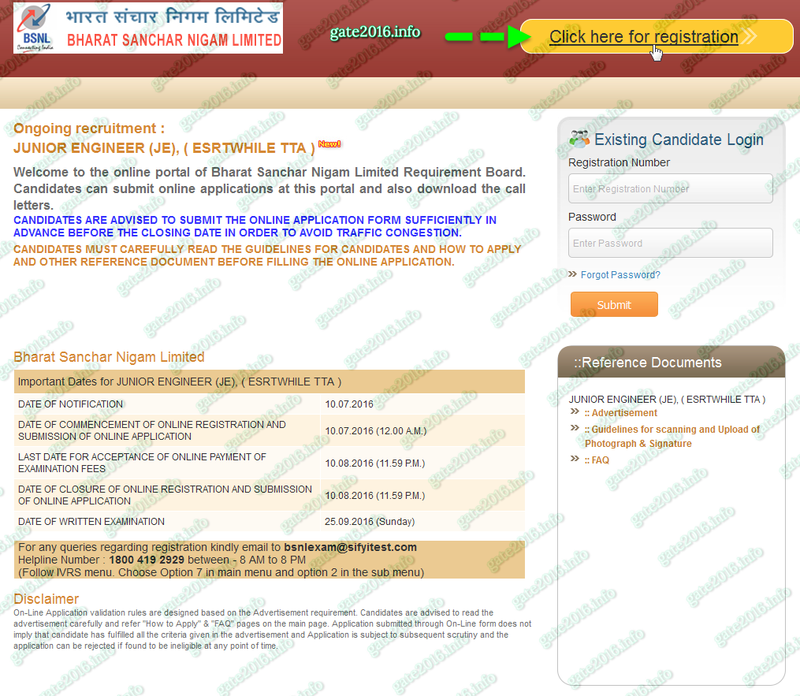 BSNL TTA(JE) 2016 online application form has 7 steps to follow by a candidates as shown in image-8. When a candidate will click on “Submit” tab he/she will directed to Registration page. Which is second step of BSNL TTA(JE) 2016 online application form. Here candidate need to fill all of his/her personal details. Candidate has already completed “Subscription” section as shown in image-8. After filling the complete personal information a candidate need to click on “Save & Next” tab in order to successfully complete his/her registration. When a candidate will click on “Save & Next” tab in order to complete his/her registration a dialog box will generate. If a candidate find that all the details entered by him is correct he/she can click on “OK” other wise click on “Cancel” as shown in image-10. When a candidate will click on “OK” tab he/she will directed to eligibility details page. Which is third step of BSNL TTA(JE) 2016 online application form. Here candidate need to fill all of his/her eligibility details. After filling the complete personal information a candidate need to click on “Save & Next” tab in order to successfully complete his/her registration as shown in image-11. 1. Is 2016 pass-out candidates are eligible for BSNL TTA(2016) exam ? Yes, 2016 pass-out candidates are eligible for BSNL TTA(2016) exam & also the same is shown in image-12. 2. Can we choose examination centre different than choice of circle for BSNL TTA(2016) exam ? Yes, You can choose examination centre different than choice of circle for BSNL TTA(2016) exam & also the same is shown in image-12. 3. What is the medium of instruction ? Medium of instruction means in which medium a candidate has completed his/her degree/diploma/B Sc/M Sc like English/Hindi/Any other language. 4. What is the total marks obtained by the candidate ? Total marks obtained by the candidate is the total marks which he/she obtained during his diploma or degree course. It is the total of all semester marks. 5. What is grade/class ? Grade means grade of your diploma or degree shows like A/B/C or class like First/Second/Third. 6. Is diploma candidates in Electronics are eligible for BSNL TTA(2016) exam ? Yes, Diploma candidates in Electronics are eligible for BSNL TTA(2016) exam & also the same is shown in image-13. 7. Is BE candidates are eligible for BSNL TTA(2016) exam ? Yes, BE candidates are eligible for BSNL TTA(2016) exam & also the same is shown in image-14. 8. Is B Tech candidates in Electronics & Communication are eligible for BSNL TTA(2016) exam ? If Yes then what to choose ? Yes, B Tech candidates in Electronics & Communication are eligible for BSNL TTA(2016) exam and they need to choose Electronics & also the same is shown in image-15. 9. Is B Sc candidates are eligible for BSNL TTA(2016) exam ? Yes, B Sc candidates are eligible for BSNL TTA(2016) exam & also the same is shown in image-16. 10. B Sc candidates of which branches are eligible for BSNL TTA(2016) exam ? B Sc in Electronics & Computer are eligible for BSNL TTA(2016) exam & also the same is shown in image-16. 11. Is M Sc candidates are eligible for BSNL TTA(2016) exam ? Yes, M Sc candidates are eligible for BSNL TTA(2016) exam & also the same is shown in image-17. 12. M Sc candidates of which branches are eligible for BSNL TTA(2016) exam ? M Sc in Electronics is eligible for BSNL TTA(2016) exam & also the same is shown in image-17. After filling the complete eligibility information a candidate need to click on “Save & Next” tab in order to successfully complete his/her registration. When a candidate will click on “Save & Next” tab in order to complete his/her eligibility details step a dialog box will generate. If a candidate find that all the details entered by him is correct he/she can click on “OK” other wise click on “Cancel” as shown in image-18. When a candidate will click on “OK” tab he/she will directed to document upload page. Which is fourth step of BSNL TTA(JE) 2016 online application form. 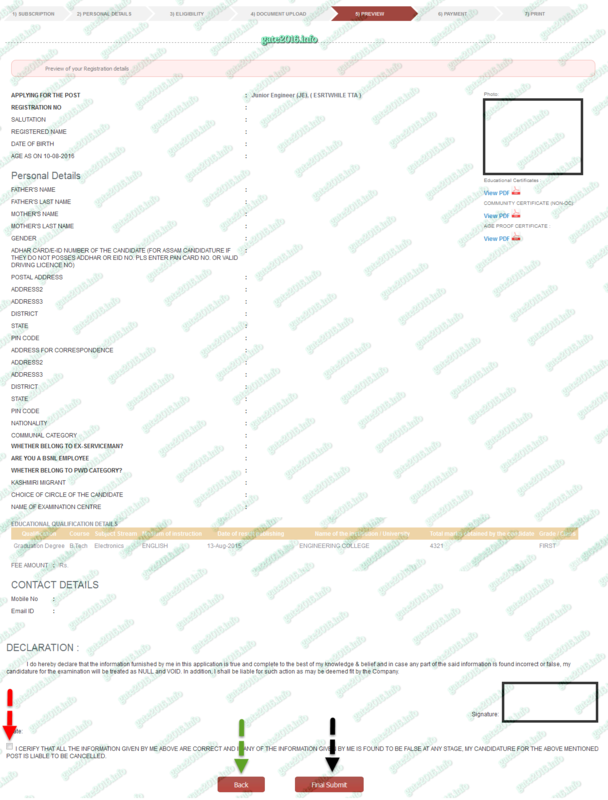 Here candidate need to upload all of his/her document which are defined on this page as shown in image-19. 2. Allowed only jpg, jpeg format. 2. Allowed only pdf format. Upload only Central certificate of SC/ST/OBC community. State SC/ST/OBC community certificates may get reject while document verification because all the communities which are in a state list of SC/ST/OBC community are not listed in the Central SC/ST/OBC community list. So if you fill BSNL TTA(JE) 2016 online application form on the basis of a state SC/ST/OBC community certificate, there is a chance of your rejection at the time of document verification. In that case you would neither eligible as SC/ST/OBC nor as general. So be careful while uploading community certificate. 1. Upload a single pdf document containing marksheets of all Certificates. 3. Allowed only pdf format. Best solution for this is to upload 10th class mark sheet, 12th class mark sheet & all semester mark sheets. Like if there are 8 semesters in a degree in engineering course then you have to upload a PDF which will contain total of 10 documents. Best solution for this is to upload 10th class mark sheet. Other options are also there like Driving License, PAN Card, Passport, Voter ID etc. After uploading all the necessary documents a candidate need to click on “Save & Next” tab in order to successfully complete his/her registration. When a candidate will click on “Save & Next” tab he/she will directed to preview page. Which is fifth step of BSNL TTA(JE) 2016 online application form. Here candidate need to check all the details which he/she has added in previous steps as shown in image-20. If you find that there are a mistake in any entry which was entered by you in previous states you can go back just by clicking “Back” tab. Notice that you can go to any previous page. If you think that everything you entered is correct then you need to check mark a square box which is at the bottom of this page and then click on “Final Submit“. When a candidate will click on “Final Submit” tab in order to finally submit his/her registration a dialog box will generate. If a candidate find that all the details entered by him is correct he/she can click on “OK” other wise click on “Cancel” as shown in image-21. When a candidate will click on “OK” tab he/she will directed to payment page. 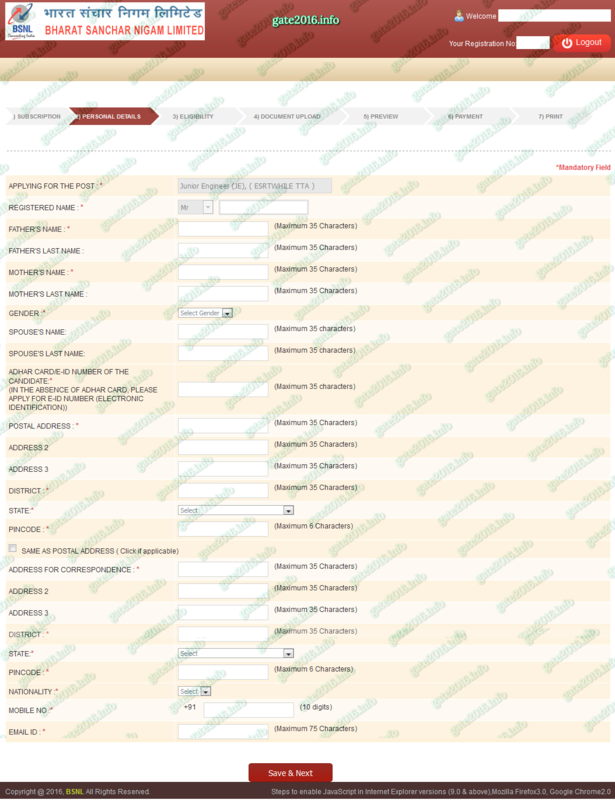 Which is sixth step of BSNL TTA(JE) 2016 online application form. Here candidate need to check mark the sqare box and select “Online” option as shown in image-22. When a candidate will click on “Submit” tab in order to pay the fee a dialog box will generate. If a candidate find that all the details entered by him is correct he/she can click on “OK” other wise click on “Cancel” as shown in image-23. When a candidate will click on “OK” tab he/she will directed to payment portal. Here candidate will find various options for payment. Candidate can choose any one out of there as shown in image-24. When an applicant will successfully done his/her payment he/she will redirect to a page where a statement written like “Your application is saved successfully” as shown in image-25. There is an option at the lower right corner named “Continue“. If a candidate click on that “Continue” tab his/her completely filled application form will generate. Applicant can download this completely filled BSNL TTA(JE) 2016 application form just by clicking “Print” tab as shown in image-26. 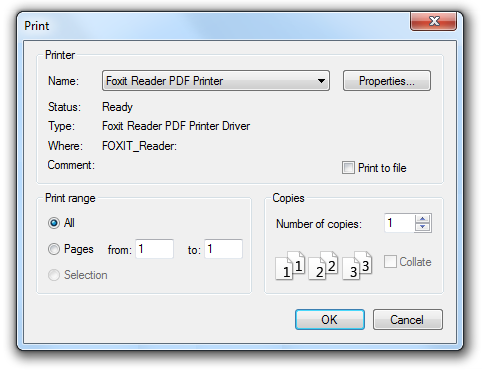 When a candidate will click on “Print” tab a dialog box will open to save that completely filled BSNL TTA(JE) 2016 application form in PDF file format. Which can save by the applicants as shown in image-27. “Dear NAME OF APPLICANT, You have successfully completed the registration for the BSNL recruitment. I got bsnl JE admit card but it shows exam date is on 26th september. But bsnl official website shows exam is 25th. Is there any mistake in my admit card? 1. When I get bsnl JE admit card ? 2. How to know the address of examination center ? 1. Please check below post regularly. 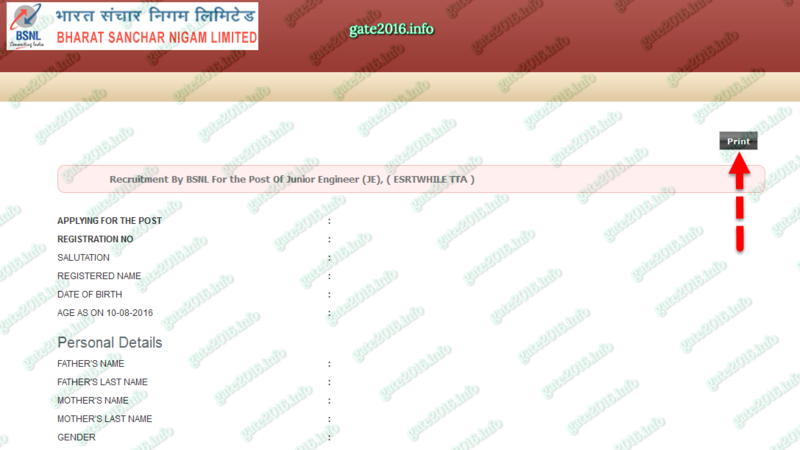 We will here update all the information related to BSNL TTA (JE) 2016 Admit Card. 2. Admit Card will show you all the details about the address of examination center. I am Pradip Shah I have completed registration for je . but their is doubt in postal address part I have written C/O jyoti electronics,New Hasimara but in my Aadhar Card the C/O jyoti electronics is not written there only New Hasimara is written on Aadhar Card is creates any problem during document verification. There would be no issue. BSNL have extended the date for alter/edit/modification till 20 august 2016..
1. In total obtain mark column I have entered my total diploma percentage which is showing on consolidate mark sheet.my tamilnadu institute was not mention total obtain mark in my certificate.they mention only each subject mark and total percentage so I was entered total percentage.whether its correct or not. If not can I change it to total marks. 2. At the time of verification how bsnl will check the marks because in my certificate there is no total obtain marks are mention.there only having total percentage. 1. You need to convert that percentage into total marks as per your university/college rules. Now you can not edit this section. 2. They will only check your marks if they found any mismatch in your marks obtained and marks filled in online application form. thanks admin for this information. I have a photostat copy of my marks card…is it ok to use the same? Is consolidate marksheet is enough to upload instead of all semester marksheets? So what do I do now…. where the security code available. if i don’t have 7th and 8th semesters marksheets so what to do? You can even upload internet copy. can i use a true copy of school leaving certificate as age proof. and i have consolidation mark sheet for all semester can i upload it? If your last semester mark sheet contain marks of all semesters then no need to upload all semesters mark sheets. I had submitted the application form for the JE examination . In the ‘ Upload Documents’ section, for education certificates, I had uploaded my final degree certificate, instead of my mark lists. The degree certificate does not contain any details regarding the marks. You need to upload all semesters / years mark sheets of your diploma / degree. If your last semester mark sheet contain marks of all semesters then no need to upload all semesters mark sheets. They want your marks details. You can modify application details only upto 5 times. If you have used 5 chances for corrections, please reapply before the closure of application date as per advertisement. can i edit COMMUNAL CATEGORY if i pay the fees. please suggest me sir……please…..
Sir, My 8th sem result is not out yet, what should i do? On the date of filling BSNL TTA(JE) 2016 online application form a candidate must possess the required education qualification i.e., must completed his/her diploma/degree. So just wait for your 8th semester result. I belong to AP circle obc category and if I apply for other state (circle) will I be treated as non local candidate? Is there any local reservation?or I will be treated as obc candidate in any circle I apply ? If your caste is under central OBC category list then you will consider as OBC candidate other wise as UR. I am 2016 pass out. I have all semester wise mark sheets,but these are attested copies. Is it OK to apply for bsnl je? You can upload them but if you have originals than scan them and upload those copies. I lost my adhar card, but i have the photocopy of my original, but i doubt whether i need to produce the original card during the time of examination. So what should i do to get EID. or can i apply for the xam using pancard/ voters card/driving license. You can get original copy of your aadhar card online. No you can not fill other information than aadhar card there. Right now Iam studying b.tech 4th year am I eligible for applying this job? if yes then I should upload all the marks list upto 3-2 semester? please help me out sir…………….. I have completed my B-tech and my final semester results are just out. So i don’t have the consolidated mark list of final semester(final year ).So how should i upload the mark-lists? 1) i have done btech in electronics and telecommmunication. what should i chose? electronics or telecomms? 2) in the “total marks obtained by the candidate” what should i enter? total marks of all sem, or percentage of all sem? or CGPA? 3) i cant find the “edit” option in the bsnl website. please check the site and help. 2. Total marks = total of all semester / year marks. Like marks of each semester is 100 and there are 8 semesters. You get 600 out of 800. Then you need to fill this 600 only in that column. They are asking “Total marks obtained by the candidate”. 3. This facility is written in BSNL TTA FAQs. So may be BSNL haven’t started it yet. Am I eligible or wht..? kindly suggest me as soon possible.. Most probably you will be eligible under Information technology. You can convert CGPA into percentage but formula for converting CGPA into percentage is different for different-different college/university. I have lost my 8th semester marksheet and also I don’t have photocopy of that. Now how can I apply for BSNL registration form. What are other alternatives? Yes if your caste comes under OBC category at central level otherwise you are UR. I’m not able to edit my application form which have been already submitted.i need to attach few more certificates as well.I do not see any “edit” button anywhere. would you please help me with the procedure. Hello there I dont have my 2nd semester marksheet may be i have lost it or such like that.so my question is can i upload the college Tabulation Register where each and everyone’s mark is given along with mine. ?please help me.if any other way to get rid of this problem please help me too. If you have any xerox copy or any internet copy same as your original mark sheet that you can upload. In my university degree grade is based upon the final year marks only, what i suppose to enter in total marks and in grade. 1. BSNL is not asking for percentage. So if you just pass the required educational course you are eligible. 2. Engineering is a four year course so you have to upload all four years marks details. I filled bsnl TTA form.Now I want to change circle .Is it possible. You must be doing mistakes in any of these two points. System will only check these two things. If your uploaded file satisfy these two, it will accept whatever you uploaded. Or is there any other way. Upload all the mark sheets. Do not left any. 1. date of result publishing = what to fill here 8 sem (B tech ) result date or the date when degree is given ? 2. Educational certificate = how to scan images to such low size , which certificate to upload if all then how to reduce size of pdf to 500 kb ? 3.Age proof certificate= which proof to submit , can we use any educational certificate . ? 4. How to know in the end that the form is successfully submitted ? 1. Date of result when your university or college publish the result on their website. 2. Reduce all the images size all per requirement like if you want to upload 10 certificate then each scanned certificate size must be with in 50kb then add all of them into a single PDF. You can do all this online or wait 1-2 days I will write a post for this in detail. 3. Best solution for this is to upload 10th class mark sheet. Other options are also there like Driving License, PAN Card, Passport, Voter ID etc. Now please contact to your college/university regarding this. I want to apply for circle Gujarat. I choose exam centre as Bangalore. It is possible. I have also contacted number given in website, they told yes. But still I am confused. You can choose different exam centre and circle of choice. In educational certificate uploading what kind of documents i have to upload??? If my engineering 8th sem marksheet contains all 1-7 sem marks obtained in that case which documents i have to upload??? 10th + 12th + 8th semester mark sheet contains all 1-7 semester marks would be enough. i am complited diploma and degree so all semester marksheet or only final certy upload. Upload 10th class mark sheet, 12th class mark sheet & all semester mark sheets of either diploma or degree. I am completed B.TECH degree in Electronics & Communication Engineering. My question is which subject write in panel of ‘Subject Stream’? (Electronics or telecommunication). Another question is my all subject of all semester contain marks in term of grade. All the marks contain in term of grade. I have SPI and CPI for all semester. How to calculate mark form grading system? Or what write in panel ‘Total marks obtained by the candidate’? 2. You can convert CGPA into percentage but formula for converting CGPA into percentage is different for different-different college/university. If your caste certificate is not central than you may get some issues at the time of document verification. May be your caste is not listed in central list of castes. For example you have SC category certificate of Maharashtra state but it will not accepted in Punjab state govt jobs. same would be the case for BSNL. Rest depends upon you. Can we edit the form before the payment of fee but I click final submit. is 2017passout students can apply for bsnl je exam??? I am a B.Tech student. I want to ask regarding total marks. In our college total marks are given in final sem marksheet. In that total marks are calculated as 25% marks of first year, 50% marks of second year, 75% marks of third year and 100% marks from last year. So sir in total marks column in the form should i fill marks given in marksheet or should i take a calculate total of all the semester marks and then write. And one more thing Sir i am writing the third time on this page but each time my comment is not published. Please reply me. You need to put total marks of all semester there. Total means 100% marks of all semester would be calculate. This is to stop illegal activities and all pending comments checked by admin self and approved while answering them. You can see almost all comments answered by us. my result is announced but i don’t have my 8th semester marksheet. So what i upload in educational qualification? You can upload internet copy. I am 2016 BE pass graduate, but my final semester result is not yet declared, so I don’t have all 8 semester mark-sheets. can I fill the form? And I have state certificate as OBC cast certificate, will they reject my registration as I don’t have central level OBC community certificate. 1. On the date of filling BSNL TTA(JE) 2016 online application form a candidate must possess the required education qualification i.e., must completed his/her diploma/degree. 2. You may face problems during document verification. Sir i fill form and select circle punjab but examination center choose raipur so its right or wrong plss ask any problem in this. I have already registered successfully for bsnl TTA. But the problem is I have only uploaded my diploma final semester mark sheet. so how can I now upload my all mark sheet’s? If your final year mark sheet contain marks of all semesters then there would be no issue. I have certain doubts on this can you please provide me a clarifying? 1. After paying the fee amount I got an tab to Print the pages I have printed and download the same page. Now I have a doubt what is Admit card is that the same as the pages which I downloaded? Or Is there any other BSNL link where I have to go and download the Admit card? Please clarify. 2. I see that in BSNL portal it is given us “WRITTEN EXAMINATION” whereas in the downloaded “Notification_TTA.PDF” it is given as “ONLINE TEST” kindly let me know how will be the exam conducted. 3. Could you let me know the address of the examination center? 1. Admit card will be available 10-15 days before exam date. 2. BSNL TTA(JE) 2016 exam is online. 3. Your exam centre will be decided by BSNL only. which is the best book for bsnl (JE) 2016 exam for all the 3 section? SIR, I have already registered.Now I found that 8 th semester certificates is not attached with the pdf (2016 pass out).but i entered the total marks. Is this lead to cancellation of my candidature?.Can i edit it during the edit period? You application will not get cancellation but you may face problems during document verification. can i mentioned cgpa in total marks place? How to mentioned total marks? Total marks = total of all semester / year marks. Like marks of each semster is 100 and there are 8 semesters. Our University gives only CGPA in every semister…I don’t know the marks obtained. What should I write in Total marks column??. Please help. Can i enter CGPA in total marks obtained? 1/ In the notification nothing is being mentioned regarding OBC(Non-creamy layer) and OBC(creamy layer), i belong to the OBC(creamy Layer) so should i apply for OBC category or Open Category? 2/ My OBC caste certificate is a state certificate not a central certificate but i belong to kumar community which i think is in the obc central list(correct me if i am wrong) so do i need a central OBC certificate or the state OBC certificate will do? if i need a central OBC certificate how do i get it? 3/ My OBC certificate was issued in 2004 so do i need to have a recent certificate ? 8th semester marksheet is not receive in tha collage yet. can we use Internet copy of marksheet? sir i am 2016 passed out student.i do not have my 4th year 2nd semester grade cards.is it ok to attach custodian form from college. sir , here asking to upload obc certificate listed in central obc community . So how to know my obc certificate is listed in central obc community or not ??? I have CGPA on my marksheet. So what should I enter in Total Marks? I have CGPA to percentage conversion. But they ask about total marks? HELLO, i just wanna know the format for age limit certification like what kind of proof i have to upload..and even im from OBC category whether i have to upload the caste certificate or income certificate? hello i don’t have aadhar card as well as E-ID number… Can i put my PAN card number? My circle is NE-II. hi, i have completed both diploma and engg in electronics. so i have 13 certificates including 10th. they are asking to upload a single pdf document and i can’t compress it to its limit that is 500kb.my certificates are compressing only to a limit of 2mb, when i try to compress even more the certificate visibility is getting even more bad.. what can i do????? plz help me anyone…. 1) Shoul exam circle and exam centre should be same or different? 2)Should i mention Total Marks or Percentage in Application form? 3)What are the certificates need to upload for application? my aadhar card get cancelled. so is there any other option to fill the form. what is an electronic id..? plz help b.tech in 2016 bt there is one backlog in last sem. revolution form is filled bt revolution result will be declared after 2 months. cn i fill the form of bsnl tta??? while filling the application at ‘Name of the institute/university’ i have entered name of the affiliated university instead of institute name , will this be a problem sir . Is there a possibility to change this sir. I have done a mistake while filling my personal form in postal address in state selection and all things are correct and have finally submitted and pay the fees also. What is the process of correcting it. Would there be any problem. i have query on total marks obtain block . i have obtain 7.83 CGPA so what to enter in total marks ? you are saying that total marks/ year but i dont understand it. need help . i have wrongly updated my address in bsnl tta requirement form i cant to change edit the address kindly help. only degree certificate doc upload ya all sem marksheet upload . us blank me marks likhne he ya percentage? I have completed my diploma electrical form gtu Gujarat..
so I got cgpa in final results. what I have to fill in the mark obtained? I have uploaded my caste com income certificate but when i press save and next, it is asking me to upload the community certificate. Please help me. But after complete in preview at the place of state others write automatically. What i do?? My OBC certificate is issued in 2012. Can I upload it? i’m belonging to obc (non cremey layer).please advise me where is low competition and which is best for applying obc. i’m confuse which circle is choosing for only getting job less competitions. All my semester results are in GPA and final in CGPA… I can convert them to percentage but total marks scored is asked here. what can be done ?? Sir i am 2012 pass out but i have lost my 8th semester marksheet can i upload degree instead of 8th semester , pls reply. hello sir correction is posible after final print.if not posible then tell me other option. In this case can I put my overall CGPA to convert in percentage and then put in the box or not?? In this case can I put to convert my final CGPA into percentage and then enter or not ?? sir i dont have semester 8th marks sheet of my B.Tech.Those results have not yet uploaded.I have 9 marks sheets out of above mentioned 10.What should i do? as you are saying convert CGPA in to percentage but what we have to enter in to total marks obtain block . as i have obtain 73.3 % percent by converting in to percent . when i submitted the form and made the payment i got a an application form… however when i am opening that form today there is a change in my address it was uttaranchal , it has become maharashtra now which is not correct. i know it is not my fault.. what should i do? go for a new registration or wait for it to be corrected? Sir while uploading the marksheets and documents, I uploaded my 10,12 and B.E final degree certificate certifying my class and university number. Will that be ok? I couldnt compress all the 10 documents clearly scanned into one pdf of 500 KB. Sir can I upload my consolidated marksheet instead of separate 8 semester marksheets? I have uploaded 10th and 12th marksheet along with Graduation certificate in the place of “All educational marksheets”. Is that ok or i need to upload all semester marksheets ? i don’t have original certificates at present so can i place xerox copies to upload education certificates. my certificates are in college. my original certificates are in college so can i upload xerox copies? sir only two certificates “10th and diploma containing 8 semesters marks” are not sufficient? I have uploaded 10,12 and all sem marksheet regarding educational cirtificate .Is this will be acceptable? just now we have completed our eighth semester in B.E,still we dint get our 7th and 8th sem marksheeet,so what we should upload in that certificate section? I’m a 2016 passed out B.Tech candidate. I’m yet to receive my professional certificate & 8th sem mark list. Is it enough for me to upload up to 7th sem mark list? Please help me. i completed my B.tech in electronic and i finally got 7.74 CGPA on base of 10. In my university formula for equivalent percentage mark = (CGPA – 0.50)* 10.
my university also not award marks, nor class/divison to a student at the semester or degree level. of Elgibility section of Graduation in step 3 of application form..
After switching to bsnl portal when I click on APPLY NOW it shows me that YOUR DEVICE IS NOT ALLOWED TO ACCESS THIS PAGE. Sir I given my BE last semester exam but result yet to come. what should I do I have given expected marks of last Sem. CGPA to percentage but how to convert percentage to marks i am from Gujarat technological university .so anyone from gtu and fill this form plz tell me. my university provides grading system,my CGPA is 8.58 out of 10 grade point but in bsnl tta there is requirement of total marks obtained.so i know conversion from CGPA to percentage BUT i don’t know how to convert percentage to marks .i am from Gujarat technological university if anyone from gtu and fill this form plz help me. educational certificates can i upload 10th btech or only btech certifiactes and i don’t have original memo for last semester 2016 so can i upload internet printed memo. Plz help… unfortunately I fill my Bsnl tta application form with pan card no…but I am from UP state and fee’s also submitted.. what should I do? sir is only marksheets of degree are enough for applying or else 10 and 12 class are also needed???? I have submitted my application and also payment done , after i found a mistake in my state i choosen . What should i do. Sir I completely fill my Bsnl tta form…fees also submitted and I got the acknowledgement from Bsnl also but after taken print of application form I saw a mistake in address…in state shows ‘other’ in respect of Uttar Pradesh but other information like district pincode I have correctly mentioned…but I am not mentioned state..now what I do sir..? Hello sir, is all btech year wise marksheet has to be uploaded????? Bcoz mine 3rd year marksheet has corrupted, so reapplied but until now that has not came……what i vl do…plz suggest????? if we dont have adhar card,it means we are unable to fill the form?? I have done b.tech in electronics and currently working in software industry.. Which subject I should go for computers or electronics in subject stream of the form. sir my 8th sem. result was out in july so i dont have original mark sheet. may i upload computer generated mark sheet. sir my 8th sem. result was out in first week of july so i dnt have original mark sheet of 8th sem. can i upload computer generated mark sheet. hlo sir , i have done B.E in computer science i have query with this form bsnl tta as i have cgpa system in my university what should i put in total marks field and grade/class field i dont know what to fill there and can i upload provisional certificate where we have to upload all sem. certificate . hlo sir , i have done my B.E in computer science i was filling bsnl tta it says total marks and grade/class . AS i did sgpa in my university i dont have total marks only cgpa of all sem or average . i dont know what to fill there and i have provisional certificate can i upload this where we need to upload semster certicate because it contains all semester marks. i have done m.tech n there is no m.tech option in online form how to do ?? Is that degree certificate needed or marksheets r enough? in the box of total marks obtained by the candidate,what should i fill as my marks are in CGPA. should i fill marks in the form of percentage?? Hello sir I have been completed Mtech IT ,I doknw whether it s exact qualification r over for TTA…but I love to work with BSNL…pls tell exact information about TTA. my query regarding total marks obtained by candidate field wt should i will write that field if i had backlog result also than plz help me. I ‘m EC student.Can I fill the form. Sir i dont have adhar card/EID number.so how can i fill up the form as they are mandatory.plz suggest me how can i get this E-ID number. Is it compulsory to upload all the marksheet in originals for the btech course as i have only 1st and 2nd year marksheet in original and rest in onlineprint marksheet. I have two queries. In total marks obtained what do we need to enter? The grand total of all the semesters or the aggregate percentage? In document upload which marksheets do we need to upload? 10th,12th and degree final marksheet or 10th, 12th and all marksheets of degree? i have not done b.e through diploma.i have done 12th, but in form the only option is diploma. What to fill in total marks ? ….total of all semester from first year OR total of last four samester (5th,6th,7th,8th)as mentoined in final semester marksheet….and what to upload in all marksheet.all marksheet including 10th and 12th ?? as iam doing my mtech i dont have original certificates. can i scan my xerox copy and upload. 10th and inter certificates are required. Hlo sir I m ece branch student actully in 8th sem in one subject I hav backlog…but I apply revalution fom..and the result of revalution is nt coming yet…so what can I do….plz response..
sir if i have 54.5% in btech what should i write in total marks obtain …… we have cgpa and grade given in marksheet not number. Is we have to upload individual semester marksheets or consolidated marksheet is enough for applying. what to write in a section “medium of instruction”,”total marks obtained by candidate”,”grade class”? hey i filled the form but in educational qualification i upload only final sem certificat and submit the form is there any problem. Sir maine pan card number se form summit kar chuka hu kya mujhe phir se registration karna hoga. And one more question please, whether in age proof birth certificate is not valid.. instead of 10th certificate?? Sir I done my diploma of ECE after 12th non med. So my diploma was of 2yr and I filled 2yr marksheets in educational qualification of bsnl JE 2016 form.is there any issue in filling these marksheets???? I have only CGPA in my diploma certificate (revision 2010). there is no total mark. What about the Obc proof,Which Certificate i want to upload,Community Certificate or non creamy layer certificate?? Hello sir, can we upload any other certificates for age proof other than Birth Certificate? what is the meaning of “MODE OF INSTRUCTION IN THIRD SECTION (ELIGIBILITY) OF APPLICATION FORM”. Can i apply for this job i have Passed B.SC (IT). Sir all semester mark sheet or provisional certificate has to be uploaded . If mark sheet mean how 8 mark sheets I have scan In single pdf and upload. sir i am be in electronics ,in the marksheets upload section i have to upload my 10, 12th and be marksheet only or i have to upload my certificates also? 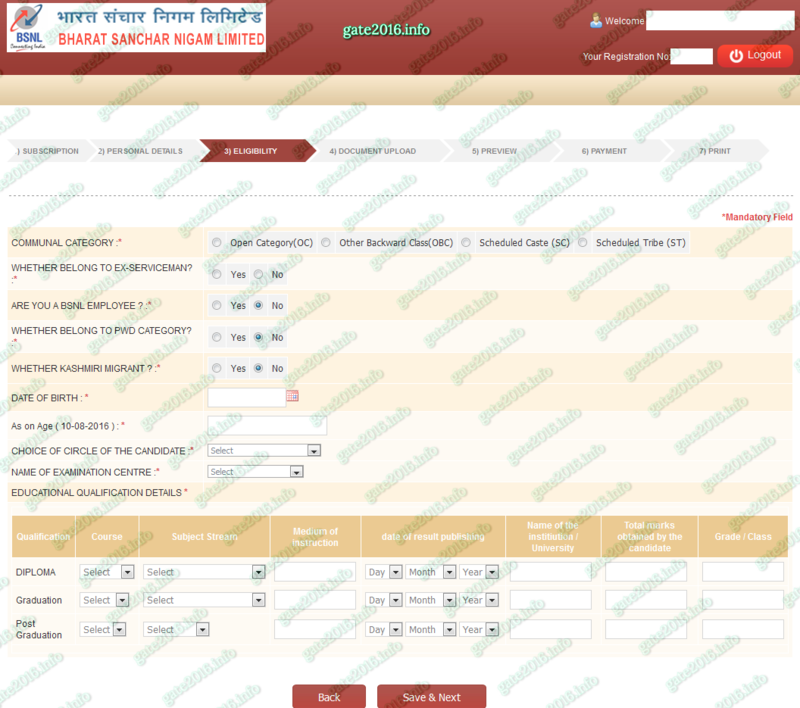 Regarding the bsnl TTA(JE) form is it necessary to select an examination centre which lies within the choice of circle? Or can i just opt for any examination centre as per my convenience? hello sir, i have some doubts regarding filling up of bsnl tta online form.firstly i am from cgpa pattern and my cgpa is 8.68. and converting it to percentage from my university criteria gives 79.3% but u have provided the link for converting cgpa to percentage gives 82%.so what should i fill? 79.3% or 82%? pls guide me..
i don’t know what to write in ‘total marks obtained by candidate’ …should i enter cgpa? In the place of OBC certificate are we able to put BC-A certificate or did we need to take new cerftificate stating as OBC? I have a doubt in selecting the category. myself BC ,whether I have to select OC or OBC. could u pls reply me..
I’m not having my 8th semester marksheet. What can i do sir..? for age proof can we upload college certificate. i have pursuing my diploma and degree in gtu. they donot give obtain marks they only provide grades and and in certificate they only provide cgpa. what i have to put in to total obtain marks?? can i upload birth certificate for age proof? For punjab circle is it necessary that 10th class should be completed in punbabi language. .? Hi…I have completed my B.E(Electronics)…I have 2 doubts in filling the application form.Looking for help to complete the form. 1)In my University there are totally 8 sem and CGPA will be printed on the mark sheet and we have only grading system.So what should I enter in the field which asks for total mark obtained by the canditate. I studied bsc computer science am i eligible for this post pls replay me. I studied bsc computer science… am i eligible for this post. i have 10th marks sheet my name on this nitu but 12th and b. tech document my name neetu. sir any problems after recruitment. Ii already completed my BE bt what should write in Educational qualification row in the column of “medium of instruction “and “date of publishing result”???? Can i Apply this job i have passed B.Sc (it). i don’t have original certificates of my 10th and intermediate and also my 4-1 & 4-2 certificates are still in college what should i do while uploading of education details. now i am in chennai, but i want to apply for bsnl tta in kolkata circle. so can i apply for kolkata circle? and then what is my exam center kolkata or chennai? hi, i completed B.E. (EIE), how fill fill the total marks obtained section in education qualification. in bsnl tta under eligibility they asked for total marks of b.tech. means total 8 sem marks total?? Hello sir how to convert all semester 8 marksheet pdf in under 500kb.if we are done then quality of marksheet is very poor and un readable. Tell me how to convert all semester. Marksheet 500 kb. I was already use all online tools. what about signature… do we need to sign only by black ink pen? what about black ball pen??? What should I enter in total marks? ……total of all semesters from first year OR total of last four semesters(5th,6th,7th,8th) as mentioned in my final marksheet….plz inform immediately. I don’t have total marks because my jniversity does not provides but only grades, now what should I do??? My diploma percent age is less than 60% can i fill form. if i apply in shimla from punjab can i choose the test center delhi or meerut?? hello sir,i want to know that in the specialization field we have to read all the subjects mentioned in syllabus or only one from them?? 1. for obc certificate what all documents have to uploaded? is it non creamy certificate enough? 2.for total mark section what to enter ? is it cgpa or percentage marks ? Sir, I am pursuing my B.tech. I am a student of 4th year. So, what should i fill in the date of result publishing and grade? Can i apply for this exam if I’m having history backlogs and one current backlog? 1.I m completed BE by ELECTRONICS AND TELECOMMUNICATIONS can i apply bcoz there is only electronics or telecommunication?? 2. And BE in MP is only cgpa there is no conform marks then what should i fill in the total marks??? Cgp will only convert in percentage not marks. I’m having history backlogs and one current backlog in final year, AM I eligible for this exam? in educational cetrificates can provisional degree can only be uploaded. I completed BE ” ELECTRONICS AND COMMUNICATION” can i aplly bcoz there is only electronics or telecommunications ??? what to write in medium of instruction. sir, scanning marksheets in a single file of 500KB is making them unreadable. how to proceed. I dnt know d exact date of result of last semester as m a student of final year . So wat to fill in d date of result published..
All i knw is d month & year of declaration of result. I am a final year student . So my last semester result is awaited . But what to fill in the date of result publish as am not knowing d exact date . sir,i completed diploma in ece with 90 percentage sir am i eligible for these post. sir i want to know that i have cgpa 8.68 aggregate of all 8 sems. then in the total marks obtained should i fill 8.68? because percentage is not mentioned in that column only total marks and i am from cgpa pattern.then i should feel my overall cgpa in that column? and secondly i have latest upgraded obc certificate but with that i also have to upload non creamy layer certificate? pls guide me……..
my area of concern is ‘AADHAR’ section because i don’t have one, but i had enrolled myself the day after BSNL advertisement out. so my question is can i fill the form with my enrollment No. hi i am rutika patil. i am in b.e. (electronics) class. i have allow to fill or not BSNL tta application form? Pls help ,Unable to upload all marks sheet doc as file size of 1 PDF of 8 semesetr mark sheet is greater than 500 KB. How to fill the Graduation grade/class field? B.E students are rated by CGPA not grades. What is the last name in personal info? Is it ur sirname or fathers name? I possess both Diploma and Engineering Certificates so i upload a single pdf with all (diploma and Engineering) Certificates or Provisional of both will go good? For the Age Proof (only 10th Marksheet is must) can I use 12th Marksheet too? i dont hv adhar card now how will i fill the form. what to fill in ” total marks obtained by the candidate”? Do I have to fill in the total of all semester marks or do i have to fill in total marks of all semester divided by total of max marks of all semester, or Do I have to fill in the aggregated CGPA of all semester? Waiting for your reply..Thanks in advance. I have some quarries regarding to the online application form fill up for BSNL TTA exam. Sir I don’t have diploma degree but I have B.tech degree. Am i eligible for applying? Cause in essential degree section it is mentioned like that Three Year Diploma/B.tech/BE in particular subjects so i think I am eligible. I am asking only for confirmation. In the educational qualification section, the candidates are asked to provide the total marks. And this part is confusing me. According to our WBUT B.Tech result the ten point scale is used. So we are only provided with the grades and CGPA in our result. So we are not aware of the exact marks we get for each subject. As for example, if we get marks between 70 to 79 we are provided with the credit point 8 in our result. We don’t actually know that what exact marks we scored in the particular subject. It might be 75 or 79 or anything. Following this rules we are provided with the over all DGPA at the final semester. I know that how to convert grade into percentage according to WBUT. My question is that can we provide the percentage marks in the box for total number cause it’s hard to get the total marks for all the four years of B.Tech. Cause our subject no varies for each semester so the total number also varies. And I have heard that there is some upload section where i need to upload some PDF certificate, Sir which kind of certificates I need to be prepared for uploading? In the upload section of degree certificate can i provide my provisional certificate of WBUT which declares that i have successfully completed the B.tech degree as my DGPA is also mentioned there?! Sir please answer as soon as possible..
What to fill in education qualification’s coloum of medium of instruction and class? Can we upload btech cmm certificate as it is the only qualification of mine or we should upload pc also help me sir. My obc certificate is of year 2013.will it be accepted? 1) I had passed 8 sem in 2014 but due to backlog in 7sem, it got cleared in 2016. So which year should be considered as degree completion? 2) For age proof, birth certificate should be uploaded? 3) I have consolidated marksheet which contains all sem marks included, is it okay to upload that? No, only Aadhar card number of 12 digit will be accepted. what all things are to be included in educational marksheets?? All semesters / years mark sheets of your diploma / degree. They are asking about professional qualification so only professional certificates need to upload. can i upload one original mark sheet containing 4 years results? Sir, what is Secondary Switching Area in BSNL Recruitment? And how it will affect our selection? list of educational certificates need to be uploaded for bsnl tta online application?? I completed B Tech this year and results came in June 2016. While filling the application form, in the date of result published section, the year 2016 is not available. What should i do? Try now. Now 2016 year option is working. In AadharcardID Field it is not taking number 0.I can enter only 11 digit out of 12.Tried in all browsers. In Eligibility section,date of result publishing field what to enter.In College provisional certificate only they mentioned date/mm/yr.In Degree certificate mentioned only month and year. In Totalmarks obtained by candiate field,what to enter.I have consolidated marksheet there it mentioned total credits earned.Is that what we need to enter. Grade/Class field can i enter like First class as mentioned in degree certificate.There is no grade given only CGPA is given. In upload section,for Education qualification can i upload consolidated marksheet where it contains marksheet of all semester.Because they mentioned single pdf to upload all Educational marksheets.Is it required to upload 10th.12th marksheet also. For OBC Certificate what format i need to get.I have no OBC certificate,can i apply now.what date i want to get obc certificate. 1. Now system is accepting. try again. 2. date of result declare of your last semester / year by college / university. Not, date written on certificate. 3. Total marks = total of all semester / year marks. 5. All semesters / years mark sheets of your diploma / degree. They are asking about professional qualification so only professional certificates need to upload. 6. Age proof Certificate – 10th class certificate which contain your DOB. 7. If you want to apply from OBC category you need to have an OBC category latest update certificate. we don’t get marks, but just grades..based on which the cgpa is calculated. please suggest something. what is actually total marks obtained? Where can we get the certificate of unemployment? How anyone should choose the circle for applying bsnl juniorengineer post i.e. on what basis? Based on total number of seats. Based on competition level in that circle in previous years. Based on your choice of place i.e., place of posting etc. hello sir i have 20 marksheet in degree. Please contact BSNL. For getting EID you will again require aadhar card number. I done my diploma of ECE after +2 and my diploma was of two yrs so I filled two yr DMC nmbrs in educational requirements of bsnl je 2016 form. Is there any issue with these details.